We just stayed here for 6 days towards the end of October. The owners and staff are very friendly and accommodating. The restrooms and shower facilities are kept clean - (immaculate might be a better description). The amount of grass available is due to the priority that the owners place on nice grass. It is GREAT! There are several acres of nice grass that is kept mowed for people to enjoy walking their pets or to use for recreation like playing catch. This is just a really well kept nice campground. Overnight stop and this is a great gem of a place to visit. 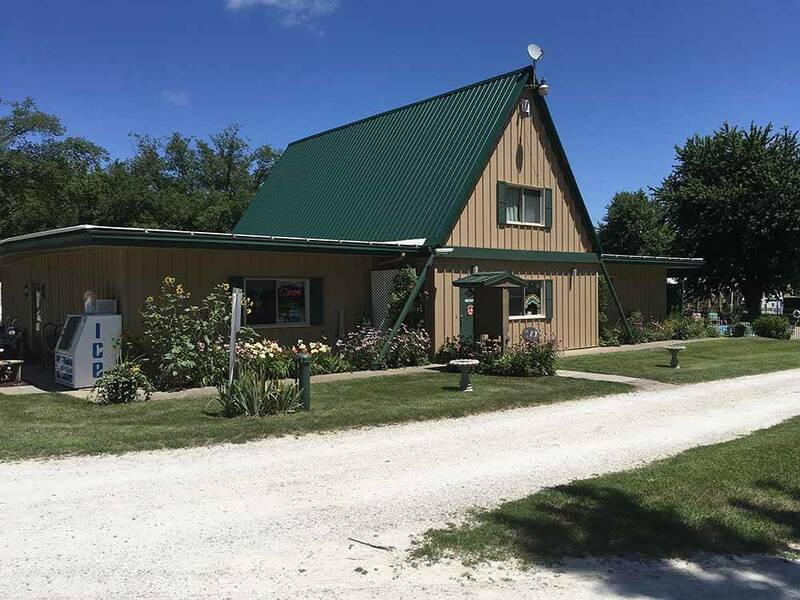 Super courteous folks, level gravel spots with lots of shade, a fun pond to fish and walk around, strong wifi, easy on/off the freeway, swimming pool (didn't use), and a small store with lots of items. Someone is around until 8 pm. Near the freeway, so if your windows are open, you will hear the traffic, didn't bother us one bit. Pull thru for our Class A and did not have to unhook...a plus for us. Highly recommend. 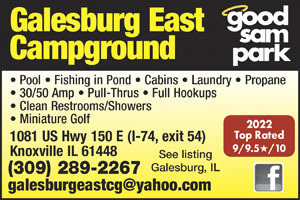 It would be very hard to find a better campground in the Galesburg area, rest of the state too. Well maintained, clean, plenty of shade, very nice heated pool, scenic hiking trails, fishing pond, big playground for kids, cabins for rent, big clean indoor pavilion, propane filling station, mini general store with camping supplies, game room, washers and dryers, huge grassy area to play and walk your dog. 90 percent of the sites are pull through with full hook ups, very easy to get in and out, 30 and 50amp available. Quiet and peaceful. Less than 5 minutes to Knoxville. Very nice golf course less than 2 miles away. Galesburg is less than 10 minutes away and several restaurants deliver to the campground. The most important reason for the good review is the owners and staff. They treat every guest like family. They go way beyond just being good park managers. Very friendly and extremely helpful. They all do everything they can to make sure your stay is easy and very enjoyable. I have been to many campgrounds and I have never seen a group of people work so hard to make sure the campground is in top notch condition all the time. New improvements are being made all the time. My wife and I stay here often. We used to travel around the state and stay at various campgrounds to visit the local attractions. Now when I ask her where does she want to camp, the answer is always the same, Galesburg East Campground. Shopping, restaurants, Lake Storey - kayaking, Amtrak station close by. We like to take the Amtrak train to Chicago to visit the museums and other attractions. Very cheap, quick and easy way to travel. It would take longer and cost more to drive. We also take the train to other cities and return the same day. This campground makes it easy to do this because of it's location. Galesburg has many events planned nearly every weekend of the year. Many opportunities for new experiences. The campground is a very good base camp to begin the adventures. I can't make enough good statements about the Galesburg East Campground. Decent enough campground, spaces were a bit close but mature trees were nice. I reserved a 50amp spot months ago which I discovered upon arrival was given away. I assume I was dealing with the owner, but not sure. He was very rude about his mistake, not apologetic at all. He did let us stay in a 30 amp spot and lent us an adapter for free. All of this would have been perfectly acceptable if his attitude was not so nasty about the situation. When returning the adapter in the morning, I thanked him and got a smirk in reply and he turned and walked away. Unfortunate we didn't meet the friendly version others encountered in their reviews. Well maintained camp grounds Just off the highway. Did not hear the highway from the grounds. Very scenic hiking trails , nice fishing pond, and a pool. What more could you ask for? This place is a gem. Beautifully maintained. plenty of trees. A little pond -- AND a walking trail that is mowed, through the woods! Charming. Close to the highway, but highway sound not bad. Owner very helpful and friendly. Wished we'd been able to stay longer. From Jct I-74 & US-150 (Exit 54): Go E 1/2 mi on US-150 (L). Note: Do not use GPS, follow blue camping signs.